Has anyone tried these? Thanks in advance. Not yet, but if like the rest of their brass it will be good stuff. In 2006 Win did a run and I bought a 100, still using them. Last edited by swheeler; 02-02-2019 at 02:52 PM. They have worked well for me. I have only shot cast in them. I think these were made by Captech, which has been closed for awhile,so if you need to add to your supply I would get them while they are available. Mine have only been loaded a few times with cast and no issues. Some Remington brass has become available also, so I have stocked up a bit on them too. I bought some a while back, for my one and only Krag (long gone), and my recollection is it loaded well -- BUT, I do not recall reloading said brass any more than maybe twice. The Krag I had had been sporterized, and when I found myself able to send it down the road, hesitated not. NO PROBLEMS, again, with the brass. At the time, I loaded/shot factory jacketed bullets in it -- don't recall which, but they seemed unGodly long...My loading was about 1/2-way between min and max, in Ken Water's Pet Loads. Bought some for reforming to 30/40AI. After forming have been reloaded six times with no issues (neck sized). Thank you everyone. I've placed my order. Is the rear face of the rim beveled as on the originals? I got them in. They look great but they aren't beveled. They're probably made from .303 British stock but I bet they work. The Lee dies are beautiful and Grafs saw fit to send a Lee primer pocket cleaner free! Good times. Hmmmm.... Yours say BCC on the head stamp. Mine say Graf. The 500 lot I got about two years ago from Grafs is a little larger than my R-P 30-40 cases. Larger just ahead of the rim and the case necks are thicker too. Not surprising, the cases weigh more than the old R-P cases and have a little less volume too. About 3 grains less. Interesting! When I posted about the bevel I compared the Graf brass to some Win brass. After seeing the pic I went back and looked again. Depending on who made the brass and maybe when the bevels were different. Some were small, some large like the R-P pictured and some were in between, even from the same maker (Win). The W-W Super brass I've got has the large bevel like the Remington brass shown here. I just necked my first 50 BCC brass from .30 to 7mm to .25 without a problem or a crease. I hope to get to the range this weekend to fireform some of them. Ordered another 100. This is some of that Graf 30-40 brass set up in the lathe to reduce the web area ahead of the rim. 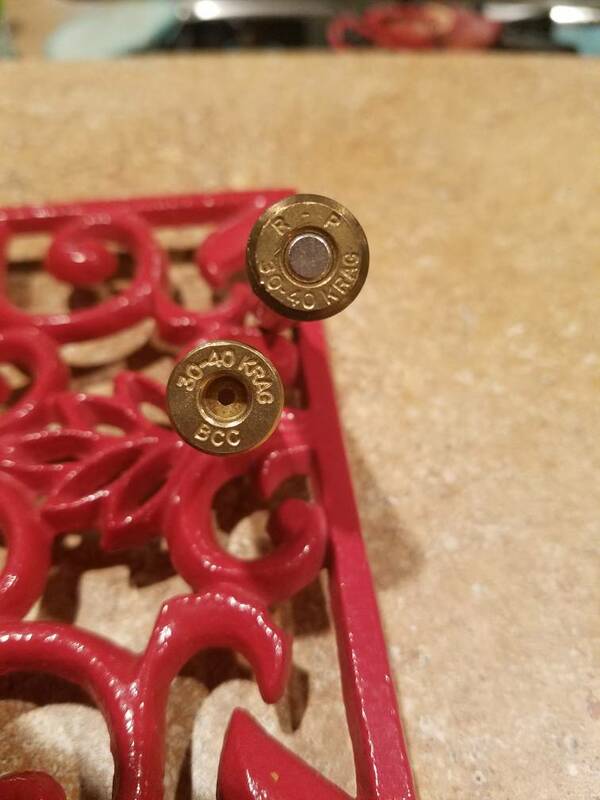 I use the 30-40 Krag brass as bases for the 40-60 Maynard case to be shot in a BPCR match rifle. The chamber in that rifle was spec'd using the slightly smaller R-P Krag brass and as it turned out, I could not use the Graf brass with out turning it to fit. The Graf brass does have a slightly smaller powder capacity. I have shot the same pieces 5-6 times working up a load. The only match, and the only target in that match I have used it, 300 meter pigs, it shot fine hitting 10 for 10 animals. I will know more about how good it is after a season of loading and shooting each piece about 20 times. Last edited by Chill Wills; 02-07-2019 at 09:08 PM. I just posted my process for making the 25 Krag AI in the section for reforming brass.